The Happy Hollisters series were a youth mystery novels started in 1953 by the Stratemeyer Syndicate and author/partner Andrew E. Svenson, using the pseudonym Jerry West. It was customary practice for the Stratemeyer Syndicate to assign pen names to series books, so that more than one author could contribute to the series; for example, The Hardy Boys and Nancy Drew series books were written by multiple authors, all of whom used the pseudonym Franklin W. Dixon or Carolyn Keene, respectively. Unlike those books, however, Jerry West was not a shared pen name. The Happy Hollisters books were all written by Andrew Svenson. The Hollister family – Pete, Pam, Ricky, Holly, and Sue – were modeled on Svenson’s own children and their family life in Bloomfield, NJ. Mr. Hollister owns The Trading Post, a hardware store and toy shop in fictional Shoreham, and is often assisted at the store by his tight-knit family. The family has fun and adventures together, but when the mysteries arise, the independent Hollister children become amateur sleuths and are allowed to investigate and solve the mysteries on their own. 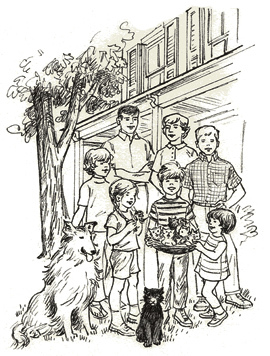 The Happy Hollisters were designed to appeal to young readers, particularly those between the ages of 4 and 12 – the ages of the Hollister family children. Children love The Happy Hollisters for the excitement and intrigue, but parents and teachers also love them for their carefully detailed educational themes. Andrew Svenson’s goal in writing the youth mystery novels series was to encourage a love of reading in children; each book was planned so that the first page would draw the reader in with a dangerous or mysterious situation, and each chapter would end with a cliffhanger or exciting twist that encouraged the child to turn the page and keep reading. Doubleday & Co. published the first four titles in the series in 1953, and four titles were usually added to the series each year. When the series was completed in 1969, there were 33 volumes, published in the U.S. and nine additional countries. After Andrew Svenson’s death in 1975, the Stratemeyer Syndicate graciously transferred the copyrights to his widow, Marian Svenson. Grosset & Dunlap, Inc. reissued four titles from the series in 1979, but all publication was discontinued at the end of 1983. Over the course of their publishing history, over 16 million copies of The Happy Hollisters series books were sold. In 2010, the Svenson Group, Inc. on behalf of the Hollister Family Properties Trust, began reissuing select volumes in both trade paperback and Kindle Ebook format. See the TRADING POST STORE page on this site for available titles! Bolded paperback titles are available for purchase via this site’s Trading Post Store, and come with FREE SHIPPING in the USA!